On July 29, 1967, tragedy struck one of the mightiest aircraft carriers in the U.S. fleet, the USS Forrestal. One of its jets accidentally fired a rocket across the flight deck and into a plane occupied by pilot John McCain. The lieutenant barely escaped his burning jet before one of its 1,000-pound bombs exploded only 1 minute and 34 seconds into the fire. That horrific explosion wiped out dozens of the crew instantly, including almost all of the specially trained firefighters. The first bomb explosion set off a horrifying chain reaction. The crew struggled for days to extinguish the fires, the 5,000 men on the ship experiencing different kinds of hell -- some trapped in damaged compartments and waiting to die, some battling rivers of flaming jet fuel to get to their buddies. Almost all of them were innocent 18- and 19-year-old kids just trying to get through a year of service, glad to have been assigned to a carrier instead of the jungles of Vietnam. But in an instant they were thrust into a tragedy that nearly destroyed the ship and took the lives of 134 men. 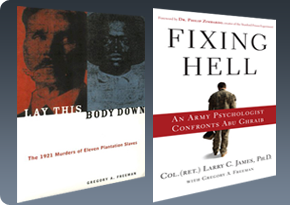 Filled with never-before-disclosed information, this riveting, meticulously documented book pieces together the events of the tragedy -- correcting the official U.S. view. For 35 years, the government has allowed the Forrestal crew to carry an undeserved share of the blame for the tragedy, never acknowledging that it sent the carrier faulty bombs that exploded before the crew even had a chance to contain the initial fire. Told through the stories of a dozen of the ship's sailors, including its former captain, it follows the Forrestal from its home in Norfolk, Virginia, to the fateful fire and its aftermath. Written with the intensity and excitement of a thriller, here is the first full minute-by-minute account of the disaster. Chapter 7: Fire on the Flight Deck! Dozens of crewmen and aviators saw Farrier rush to the worst of the fire around McCain's plane, with no more protection than anyone else on deck, and less than some. Shaver was nearby, struggling to activate the fire extinguisher with his broken right hand. He had to put the extinguisher on the deck and crouch down, holding the metal canister between his legs as he squeezed the lever to spray the purple powder. In what seemed an instant, the canister was empty. As Farrier got to McCain's plane, he saw that the two 1,000-lb. bombs had dropped from its belly and one had rolled about six feet towards the center of the deck. These were two of the old composition B, WWII-era bombs that had so upset the ordnance crew the night before -- the ones that they said had decayed so much they were extremely sensitive to heat and vibration. They had said these bombs would explode in a fire, rather than just burning like the more modern bombs. And they would explode with the power of a 1,500-lb. bomb because of their age. Farrier had no idea. Lying in the flaming jet fuel, the huge bomb was quickly heating up. A longitudinal split had already formed in the outer shell of the bomb. Other crewmen and aviators alternated between running for their lives and fighting their way towards the flames to help their buddies. About a minute and a half into the fire, dozens of crew members still were in the vicinity of McCain's plane and the fire farther aft, and some pilots were still strapped into their planes. The Repair 8 crew was training hoses on the burning Skyhawks, along with other crewmen who grabbed the first hose they could find and charge into the danger zone. Just feet from the flames, Farrier did what he could with the wholly inadequate fire extinguisher. He sprayed clouds of PKP into the flames with little effect. He could see that the situation was reaching a point where it was far too dangerous to have so many rescuers this close by, and he started waving off the other crew, telling then to run for safety. Shaver looked up to see Farrier frantically waving at him and the other crew members. "Go! Get out of here!" he yelled over the roar of the fire. "Get out!" Some men dropped what they were doing and ran, but many continued to play their hoses on the burning planes. Shaver's fire extinguisher was empty, so he started to get up. Farrier stayed on the job, never leaving the men he knew were trapped beyond the curtain of fire, doggedly training a portable fire extinguisher on a bomb that was rapidly approaching its cook-off point. As the thick black smoke billowed and swirled, Farrier and Shaver could see that the 1,000-lb. bomb with the ugly split in its casing had begun to glow a bright red. The three men dragged themselves over toward the hatch leading to the gun mount structure, and with a mixture of dread and hope, Crutchley slowly opened it. He peered out as he opened the hatch just a couple of inches, and the sunlight flooded into the dark compartment. Without opening the hatch too much, he tried to see what awaited them on the other side. Crutchley opened the hatch wider and saw that the gun mount was indeed a mess, but the fire was on the other end, away from the hatch. All three men scrambled over the lip of the hatch and fell onto the gun mount platform, breathing heavily and coughing as they took in the clean sea air. The gun mount was far from a safe place to be, but it was a damned sight better than dying in that smoke-filled control room. After getting their breath again, the men realized they still could not rest. The gun mount was right under the flight deck fires, and periodically they had to dodge flaming fuel, debris, and molten metal. There was no other way off the gun mount platform except the hatch they had just come through, so their only other option was jumping overboard. They started talking about that, but no one liked the idea much. The only good point was that they'd found a bunch of life jackets lying around. The gun mount platform had a life jacket storage bin and one of the explosions had blown it open. Jackets were floating around in the water and foam swill that covered the platform, so they started looking for one that hadn't been damaged. They found three good jackets and put them over their heads, strapping the waist belts around. Then they went to the railing farthest from the fire and debated whether to jump. Nobody wanted to, but it didn't take long for them to decide they had to go overboard, because the gun mount structure was getting worse every minute. They were scared to death of going in the water, knowing how risky that would be, but Crutchley decided they had to. The three men climbed over the railing and held on to the ship as they looked down at the 60 feet they would fall before hitting the water. Hanging from the railing, there was nothing between them and the water far below. They felt the wind on their faces and turned away as a gust of smoke choked them. They kept looking down at the sea and back at the fire, holding on tight to the railing. A destroyer was approaching from the rear, giving them some hope that they would be rescued after they hit the water. But they also worried that the destroyer would run over them. All they had to do was let go. But they hesitated. And in that second, one of the men spoke. "Whaddya mean you're not jumping? We have to!" he replied. "I can't swim. This vest isn't going to be enough. I can't swim." Crutchley realized that the man had come to the Forrestal through the Navy Reserve, which didn't require its recruits to prove they could swim as the regular Navy did. Crutchley didn't feel like he could force the man to go overboard if he couldn't swim, and they certainly weren't going to leave him behind. Besides, Crutchley and the third man weren't eager to jump overboard either. So the three men climbed back over the railing and tried to think of another plan. They were arguing about whether there really could be any other plan, and still considering the idea of jumping, when the flaming tail section of an airplane came tumbling down from the flight deck and crashed onto the gun mount right near them. The scale of the tragedy aboard the USS Forrestal on July 29, 1967, was surpassed only by the bravery of the men who fought the inferno that should have consumed it. I will never forget that day, not simply because it was one of the worst accidents in the history of the Navy, but because thousands struggled for days, and 134 men perished, to save the ship and all aboard, including me. Their heroism is memorialized in this riveting account of the Forrestal fire. I cannot recommend this book enough. 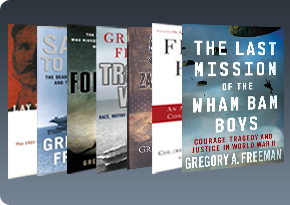 Gregory A. Freeman is a masterful storyteller. SAILORS TO THE END is meticulously researched and told with an amazing sense of drama. The story literally jumps off the page amid smoke, screams, and unimaginable chaos, the poignant and gripping struggle of ordinary men enduring the unimaginable. 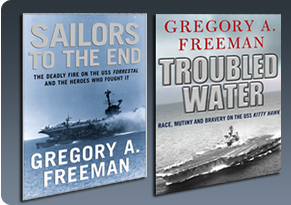 Freeman uses his incredible skill to tell this tale through the men -- and he is pitch perfect. 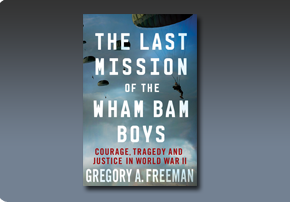 The survivors of this story walk among us as heroes, and for that we -- and our country -- have Freeman to thank. 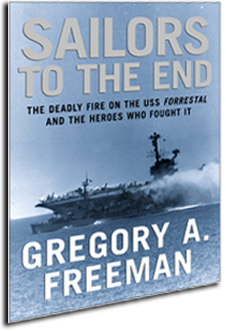 SAILORS TO THE END is a gripping, and disturbing, account of the worst accident the U.S. Navy has suffered since World War II. It is the story of tragic mistakes, yet uncommon valor. Forgotten 500 list of rescued airmen has been updated! The list of airmen rescued in Operation Halyard that was included in THE FORGOTTEN 500 was known to be incomplete, and many people have asked if their family members might have been rescued even though they weren’t on the list. Now we have an updated list, thanks to the great research by Wendy Irwin, a relative of one of the men rescued. Using the Missing Air Crew Reports that were filed after a bomber went down, Wendy has added a number of crew members who most likely were sheltered by Draja Mihailovich and rescued in the Operation Halyard flights. We still can’t call the list complete, so your relative might have been part of Operation Halyard even if his name isn’t included. But this is a great addition to the Forgotten 500 canon and I hope it answers important questions for some families. See the updated list here. Order your copy of THE FORGOTTEN 500 here. THE FORGOTTEN 500 now available in Italian! The story of Operation Halyard and rescue of airmen in World War II is now available in an Italian translation. This follows the Serbian translation that was released a few years ago. The Italian version is I 500 SOPRAVVISSUTI and is available here. The Gathering Wind is coming on October 29! 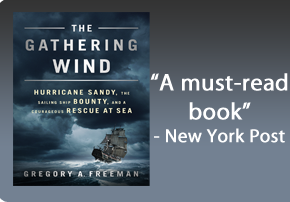 On the one-year anniversary of the loss of the great sailing ship Bounty in Hurricane Sandy, I will release The Gathering Wind: Hurricane Sandy, the Sailing Ship Bounty, and a Courageous Rescue at Sea. Based on interviews with Bounty survivors and unfettered access to Coast Guard rescue team members, The Gathering Wind offers not only the first, but the most complete account of this heartbreaking, thrilling, and inspirational story. Why in the world was an old wooden ship sailing directly into a hurricane? Why did the crew go along with the captain’s decision? This book will tell you. I was honored to get to know the Bounty survivors and the rescuers who willingly flew into one of the worst hurricanes in history. 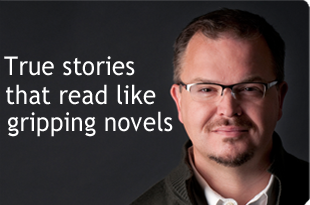 Their story will have your attention from the first page to the last. A new chapter will soon be available for everyone who loved the story in The Forgotten 500. 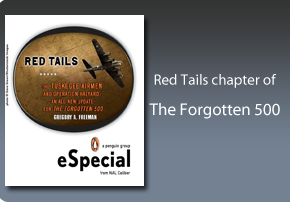 Titled Red Tails, this chapter tells of the previously unknown contribution of the famed Tuskegee Airmen, the first black pilots in World War II, to the rescue of more than 500 American airmen behind enemy lines. The new chapter will be available as an e-book download and includes a summary of the entire story told in The Forgotten 500. Watch this site for information on how to order Red Tails. 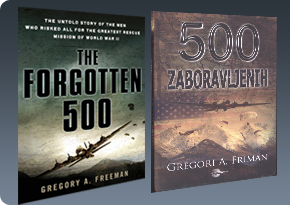 The Serbian translation of The Forgotten 500 is on sale in Serbia and can be ordered in the U.S. The title is 500 Zaboravljenih by Gregori A. Friman. To order, send an e-mail to Marko at marko@evro-giunti.com and he will arrange the purchase and shipment. Friends on Facebook and Twitter receive all the latest news on books, appearances, and other opportunities.